“This is a tempered version of the Coriander and Coconut Chutney we made last week,” Isha told Hosh, “but it will taste and look completely different to the last week’s preparation." 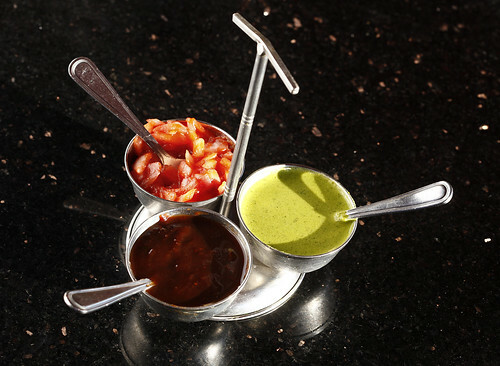 “Chutneys are sides, so you can easily modify the quantities and preparation methods to suit, as long as certain basic principles are followed." "We’ll use chili today and coriander, but for our European guests, I generally leave these out, and use parsley instead." “How many people will it serve Ma, and how long will it keep?” asked Hosh. As before, Hosh put the fresh coriander leaves in a measuring cup, pressing gently. Then he put all the 'main' ingredients in a mini wizz (or food processor) and blended until smooth. He tasted it and beamed. Isha tipped that he could add a teaspoon of sugar, if he ever had Gujarati friends. She heated oil in a small frying pan, and added mustard seeds and Urad dal. They served the chutney with idli, dosa, vada and snacks that night, and as expected, it was a hit. The little bit left over was used up with breakfast sandwiches the next morning.